IDF bases are being beefed up with “Special Forces” of yeshiva students who will blow the shofar and help lead High Holiday prayers. IDF bases and outposts are being beefed up with “Special Forces” of former and current Hesder yeshiva students who will blow the shofar and help lead High Holiday prayers. Former Beit Orot Hesder yeshiva students Sarel Shapir and Nadav Malcha said former and current Hesder students will be deployed throughout the country to make sure there is a minimum of the 10 men required for a minyan (public prayer). The volunteers will blow the shofar and help lead the prayers on the two days of Rosh HaShanah, the beginning of the Jewish New Year, which starts Monday night, September 16. 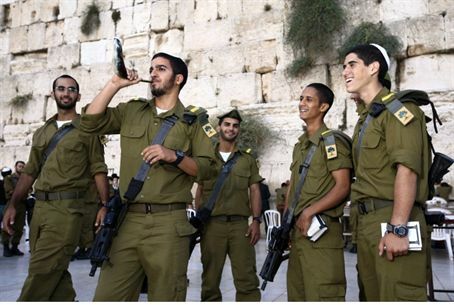 Thousands of Israeli soldiers remain at their bases and isolated outposts on the Sabbath and holidays. The sensitive security situation in the south, where Sinai and Gaza terror is on the rise, and in the north, where the Syria civil war is being fought up to Israel’s border, has placed many units on alert and kept thousands of soldiers from going home for the holidays. “This effort will strengthen IDF soldiers and give them a closer feeling [to the holidays] even when they are away from their families and homes,” said Shapir. He and Malcha have established headquarters where army rabbis and soldier can ask for reinforcements for prayer services. “This is a wonderful effort that grew from the grassroots and underscores the connection between Hesder yeshivas and the army and soldiers, said Hesder yeshiva movement director Eitan Uzi.